During the IMC19 in Sydney Delmic will present new imaging modes of the SPARC system: time-resolved cathodoluminescence imaging (g(2) and lifetime mapping). Measurements acquired with these imaging modes can be extremely valuable for a large range of applications. 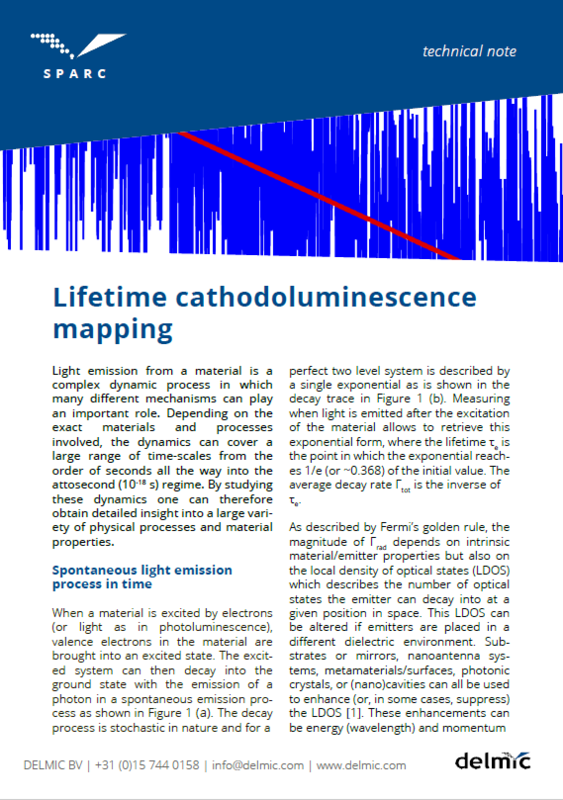 The new technical note explains the mechanism of the lifetime mapping and its possibilities for various applications. Time-resolved cathodoluminescence is a technique in which the time dynamics of the cathodoluminescence emission process is observed (watch a video of our application specialist explaining it in more details). This type of imaging allows to understand how fast light is emitted from a material when it is irradiated with electrons and how light is distributed in time. One of the time-resolved techniques is lifetime (or decay trace) mapping, which can help, for example, to identify a material defect. It is also very strongly linked to the material quality, therefore it can be used to characterize materials to improve their performance. The extracted lifetime depends on intrinsic material properties as well as the local optical environment (LDOS) and can be used to obtain information on both. Lifetime mapping can be used to study and map the LDOS in nanoscale geometries where (single) emitters such as quantum dots or NV centers are combined with a nanophotonic structure (e.g. nanoantenna(s), photonic crystal). The ability to track lifetime processes at the nanoscale, in combination with the full analytical options offered by the SEM, is a powerful new tool for characterizing materials and optical behaviors at the nanoscale. To read more about it, please download the technical note below. If you are planning to visit the IMC19 in September, you can be the first one to know more about this new imaging mode from a personal demonstration provided by Delmic. The spots are limited, so if you want to reserve a place, we recommend you to register as soon as possible.